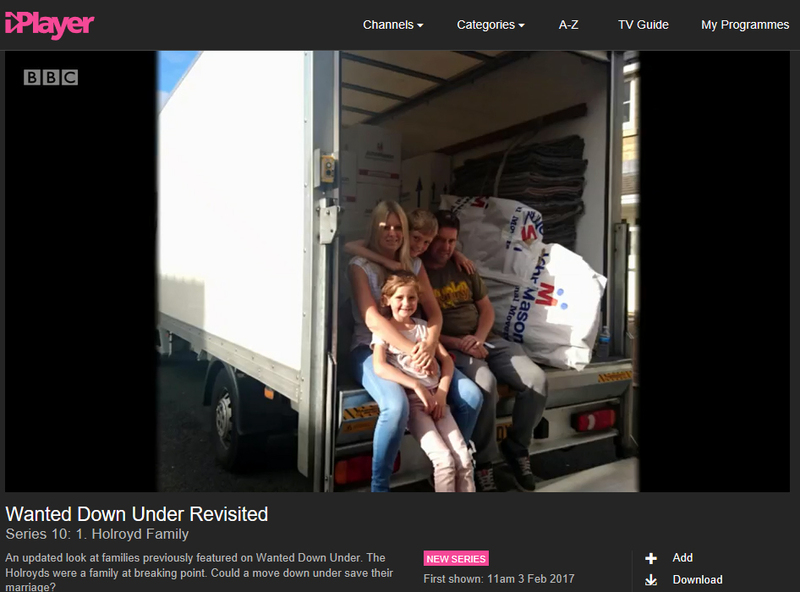 Last week John Mason International featured on BBC One’s popular daytime television show ‘Wanted Down Under Revisited’. The show presented by Nicki Chapman provides an update on families previously featured on Wanted Down Under. This episode focused on the Holroyd family, who moved from Manchester to Brisbane, Australia. Below is a synopsis from BBC iplayer: “An updated look at families previously featured on Wanted Down Under. The Holroyds were a family at breaking point. Could a move down under save their marriage? Life was hard for the Holroyds in 2015. Dad Simon’s working week started at 2.45am on Monday morning and didn’t finish until after 8.00pm on Friday night. When he eventually got home, he was too tired to spend any quality time with his family. The routine was driving loving wife Helen to tears every day, and threatened to tear her family apart. Desperate for change, she believed a fresh start for her family in Australia could be the solution. But leaving the UK would also mean Helen having to say goodbye to her mum, the one person who was always there for her at home. The show is available to view on BBC iPlayer until early March.